Let me start with a folktale: an old and very senile king wants to know which of his daughters loves him the most. The elder sister says she cherishes him more than the whole kingdom. The younger one, though, loves him “as dear as meat loves salt”. The king gets upset and orders her execution. As most fairy tales, it has a happy ending: the king is served dinner without salt, learns his lesson, stops the execution and everyone lives happily ever after. 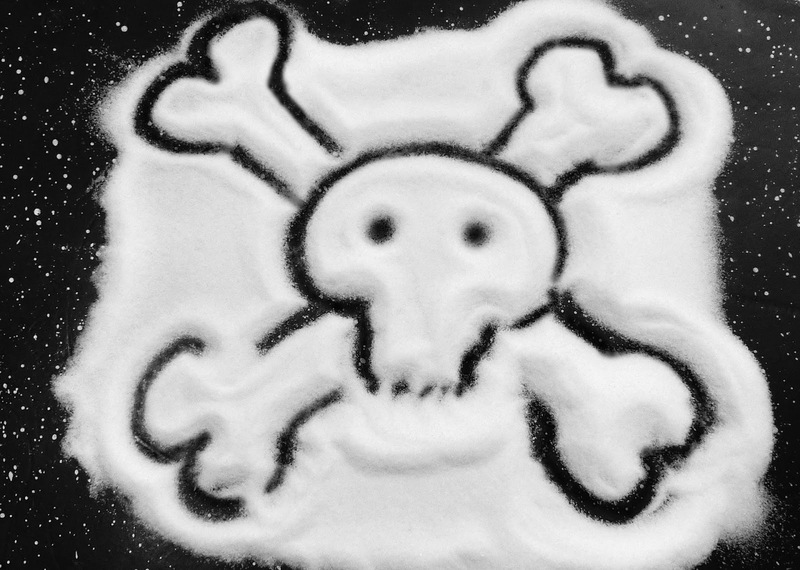 In the modern world this story of a salt-loving family might have another sad “end” – end stage kidney disease, and a broke king spending a lot of gold coins on healthcare. It might have ended differently for him though if we had a better understanding of renal electrolyte handing during a high salt diet. 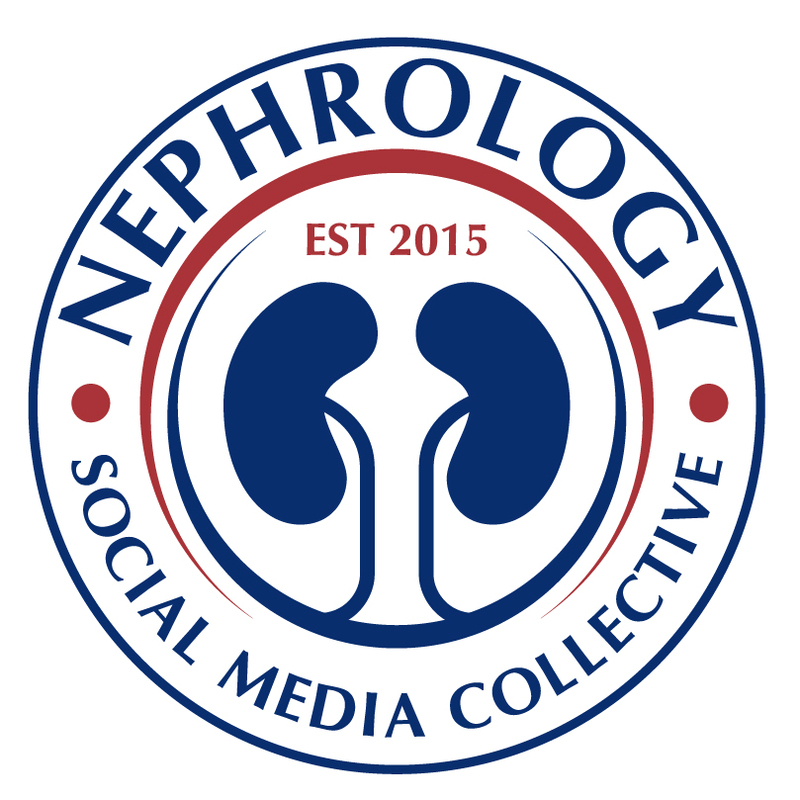 This is a million-dollar question (actually, it’s more like hundreds-of-millions-of-dollars-question – I hope someone at NIH reads this blog); we need to know what happens in the kidney at the molecular and cellular level in a disease state. Knowing all the tiny details would be immensely helpful to discover new pharmacological targets. One of the most studied drug targets for renal diseases are ion channels, and electrophysiology is a sophisticated method for measuring ion channel activity. In my lab at the Medical University of South Carolina among other things we use electrophysiology to uncover the mechanisms that underlie salt-sensitive hypertension. Since the Nobel Prize in Physiology and Medicine awarded to Erwin Neher and Bert Sakmann for their “discoveries concerning the function of single ion channels in cells" in 1991, electrophysiology has been an immense help to basic and clinical science. Although this technique is very widespread in brain and cardiovascular research, there is only a handful of labs that use it to answer nephrological questions. I have learnt it during my postdoctoral training in the laboratory of Dr. Alexander Staruschenko (Medical College of Wisconsin) where it has been successfully applied to study kidney function for years. So what exactly is electrophysiology? Basically, it is a technique that allows direct measurement of how ions (Na+, K+, Cl-, Ca2+ - you name it) move through ion channels in the cell membrane. Using a tiny glass micropipette with an electrode in it, and a micromanipulator, we can press the tip of the pipette to plasma membrane of the cell, and isolate a patch of it that is under the tip (hence the other name of the approach – patch clamp). Since ions have a charge, their movement through the channel to the other side of the membrane generates current that can be sensed by the microelectrode in the pipette. Of course, sensing movement of single ions requires sophisticated amplifiers, filters, digitizers, grounding, knowing Ohm’s law and having a graduate degree in physics (kidding – though I have one, and it does help), and a ton of patience. 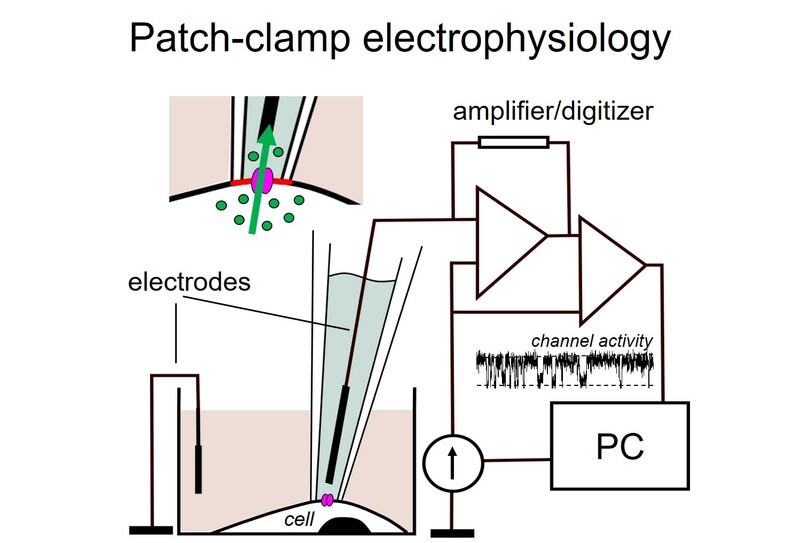 When performing a patch-clamp experiment we control the environment that the cell is in (we choose the extracellular solution, what we put in the patch micropipette, what voltage we apply to the membrane etc), and this allows us to use different tricks to identify ion channels and then learn how to tweak or test their activity. 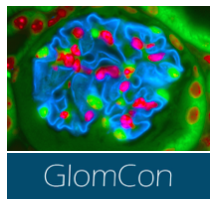 Using cultured cells, tissues isolated from animal models, or human biopsies, we can directly measure the activity of ion channels and assess what happens in a certain disease condition. 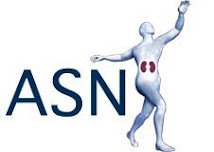 Over the years, scientists have discovered dozens of crucial renal ion channels conducting sodium, calcium, chloride, potassium, magnesium… more are discovered every year. Gain- or loss-of-function mutations that lead to renal diseases have been reported for pretty much each and every one of them. In disease states such as salt-sensitive hypertension a handful of ion channels are known to work improperly, and in order to advance our treatment strategies we need to know how these channels are mediated, what signaling pathways affect them, and what pharmacology can be used to change their activity. As an example, in Dr. Staruschenko’s laboratory it has been shown that epithelial sodium channel (ENaC) in the cortical collecting ducts can be overly active in salt-sensitive hypertension (PMID: 28003189), which meaningfully contributes to an increase in blood pressure. Therefore, specific targeting this ion channel could be a successful means to combat blood pressure in this setting. One of my good colleagues once compared ion channel electrophysiology to fishing. I have never fished in my life, but since I’ve done a lot of patch-clamp I feel I could easily have an alternative career as a fisherwoman. 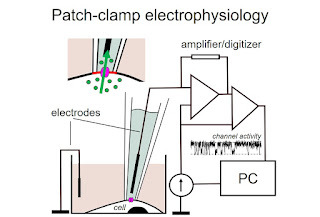 Nevertheless, although patch clamp electrophysiology is a “long wait – high reward” approach, this unique technique is crucial for our understanding of renal electrolyte handling, and – in skilled and patient hands - it has tremendous potential to push the medical field forward.